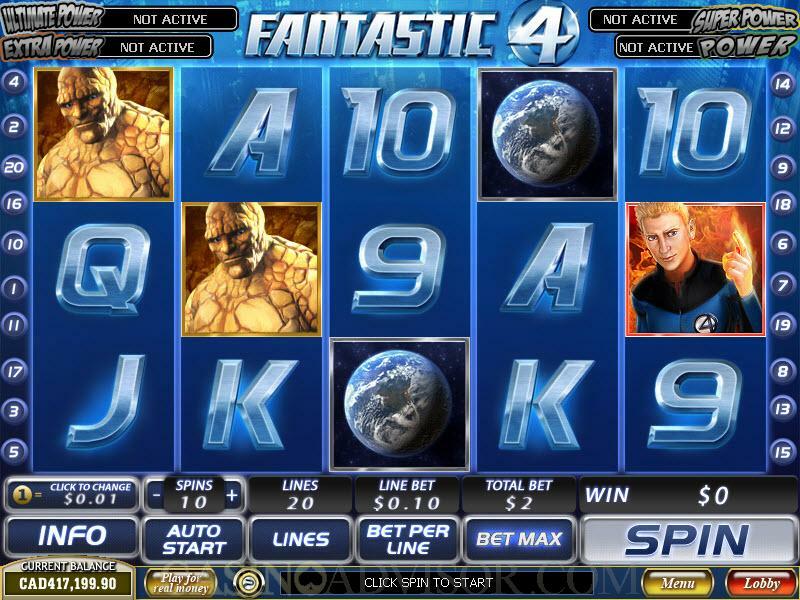 Fantastic Four is one of the more popular Marvel superhero slot games. This is probably because Fantastic Four was the first superhero team. The members of the Fantastic Four are Mr. Fantastic, a scientific genius, the Invisible Woman, his wife, the Human Torch and the Thing. They acquired superpowers due to exposure to cosmic rays during a scientific mission to outer space. The villain in this slot game is Dr. Doom. All five characters are represented on the reels as wild symbols. The scatter symbol is the Fantastic Four logo. The other symbols connected with the Fantastic Four story are the DNA, the Fantastic Four headquarters, the vehicle and the chemical flask. High value cards from nine to ace make up the remaining symbols. 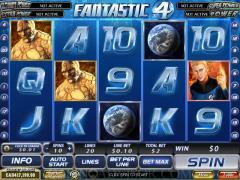 The Fantastic Four is a 25 payline slot game. The players can select the number of paylines and the coin size only. They have to wager with one coin per payline. The coin sizes offered are 0.01, 0.02, 0.03, 0.04, 0.05, 0.10, 0.15, 0.20, 0.25, 0.50, 0.75, 1.00, 2.00 3.00, 4.00 and 5.00. All the five main characters are wild symbols but each of them appears only in their designated reels. When all five of them appear simultaneously in an active payline the highest fixed jackpot of 5000 coins is hit. When two or more scatter symbols appear on the reels the scatter payout is given. Three or more scatter symbols activate the bonus feature, known as the Fantastic Four feature. In the bonus feature the player is given a choice from five different free spins games. Each game is associated with one of the characters. Mr. Fantastic offers 15 free spins at doubled payouts. When he appears on Reel 1 during free spins all the symbols on that reel become wild symbols. The Invisible Woman offers 10 free spins at tripled payouts. When she appears on Reel 2 an additional free spin is granted. The Human Torch offers 10 free spins at tripled payouts. During free spins the Human Torch can appear on any of the reels and act as a wild symbol. The Thing offers 15 free spins at a multiplier that can vary between 2x and 10x. Dr. Doom offers an amazing free spins game at tripled payouts. The free spins continue till Dr. Doom appears on Reel 5 during the free spins. The Fantastic Four feature cannot be retriggered. Fantastic Four offers the three layer Marvel progressive jackpot consisting of Marvel Hero, Super Hero and Hero jackpots. This jackpot is hit randomly without having specified symbols appear on a payline. Players who wager larger amounts will stand a greater chance of hitting the jackpot. Interested in reading more detailed information about Fantastic Four? If so Click Here for more details.